Exclusive pewter-girded Beerstein: Royalty Stein: Charlemagne. This is one of the remarkable Thewalt pewter picture steins. Each of these pewter-girded stein shows a historical personality of art masterworks. These steins are all low-number limited editions, in this case of 5,000 pieces worldwide. Each stein has a serial number on the bottom. This stein is in reminiscence of Charlemagne, the great 8th century German emperor. His picture is presented in pewter relief, flanked by two knights in full armor. 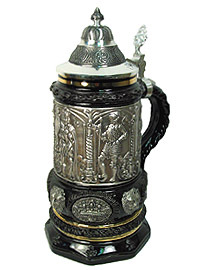 This stein has additional pewter ornaments on it, lion's heads and crowns. 1/2L, 9,65 inches tall, pointed quality pewter top. A beerstein made by the Thewalt beerstein factory, in the so-called Kannenbaeckerland, the German pottery and beerstein center. Unfortunately, the Thewalt beerstein factory has closed down in May 2009, after producing steins for 116 years. All steins currently on the market are remainders of stock. These steins are already rarities and will become so even more. No more steins by Thewalt will be produced. Due to this the limitation edition numbers of the stein have not been fully produced!